go Trick or Treating tonight, hope the rain holds off. 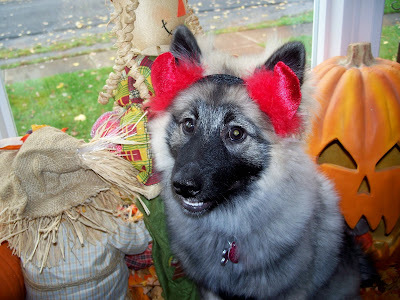 I'll leave you with a picture of our puppy in her costume, which by the way, was chosen on purpose, she is the DEVIL!!!!! She has recently sprouted all new "Fangs" too! Oh so cute! Happy Halloween! Uh Oh sounds like the chewing stage. Good luck Momma! But with that face I know you won't stay mad for long. lovely foto of your dog!! haha. she is to adoralble and I bet she is also inviting to stoke because of her fur, I think. it looks so soft.